Susan Willeke, education and communications administrator for the Ohio Ethics Commission, gave a lively presentation on the Ohio Ethics Law to Auglaize County public officials Monday at the Wapakoneta Performing Arts Center. WAPAKONETA — Nepotism is the most frequently investigated ethic violation encountered by the Ohio Ethics Commission, said Susan Willeke, the commission’s education and communications administrator, during an ethics law training presentation Monday. 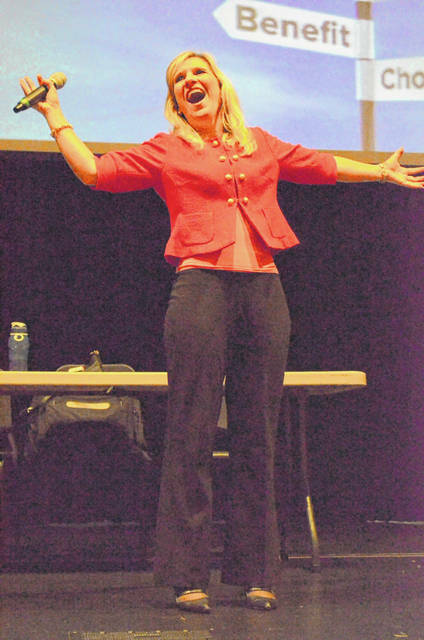 Nepotism was just aspect of the ethics law Willeke discussed with Auglaize County government and public officials gathered at the Wapakoneta Performing Arts Center in the high school. She said the purpose of holding these presentations is to help public and state government officials understand the details involving the Ohio Ethics Law before they do something to break it. “You know, most people don’t wake up in the morning doing the villain hand swipe, planning to abuse their position,” she said, twirling her fingers together and performing a villainous laugh. Willeke focused most of her attention on conflict of interest law and nepotism. Willeke said nepotism can be an easy law to violate in rural regions compared to urban areas because of lower populations and it’s also easy to misunderstand. It is written to prevent public officials from influencing or hiring their immediate family but not distant relatives like cousins, uncles unless those relatives live under the same rough as the official. The commission investigated a case in the state where a mother employed as a public official with a school board pushed to get her daughter hired as a teacher at the area school, Willeke said. She emailed the daughter’s resume to the superintendent asking him to look at it. The mother even called members of the school board the night they were going to vote whether to hire the daughter and insisted they vote to hire her. Conflicts of interest can be an easy law to break because of an incomplete understanding of what it means, she said. At one of Willeke’s presentations, a young man approached her afterward and said he realized now he shouldn’t be inspecting his parents’ restaurant. It isn’t a crime under the Ohio Ethics Law to have a conflict of interest, but it is a crime to act on it, Willeke said. While this young man might have inspected the restaurant with complete objectivity, it was still a crime for him to do so in the first place. If there was no other health inspector in the area to do the inspection, bringing one in from outside the area would be preferable to violating the ethics code.